Super hero fans, gather round for this one! This easy-to-make Hulk Cookies recipe uses ready-made fondant and icing to make a one-of-a-kind Avengers cookie fit for any super hero in your life! If you love superheroes, you’re going to love this easy superhero cookie recipe! These Hulk Cookies are made easily with your favorite sugar cookies recipe or mix and ready-made fondant! Easy recipes like this make it super simple to duplicate and triplicate should you want to make a lot for a larger gathering or party! They can be made in advance, individually wrapped, and more! Wouldn’t these make such a sweet treat for an Avengers fan? I use my favorite sugar cookie recipe here to make these. You can use the same recipe as I did, you can use a refrigerated sugar cookie dough mix, or a box mix, whatever you want to do! I leave it up to you because I know when it comes to cut-out sugar cookies like these, some folks have a good ol’ tried and true recipe they make again and again that they can rely upon for baking during the holidays and such. So long as it’s cut and baked into the appropriate size with the recommended circle cookie cutter, use whichever sugar cookie recipe you desire will be perfect! Imagine your child bringing these to their classroom for a birthday or class party! Or, can you imagine serving these at Halloween, or for your child’s birthday parties? 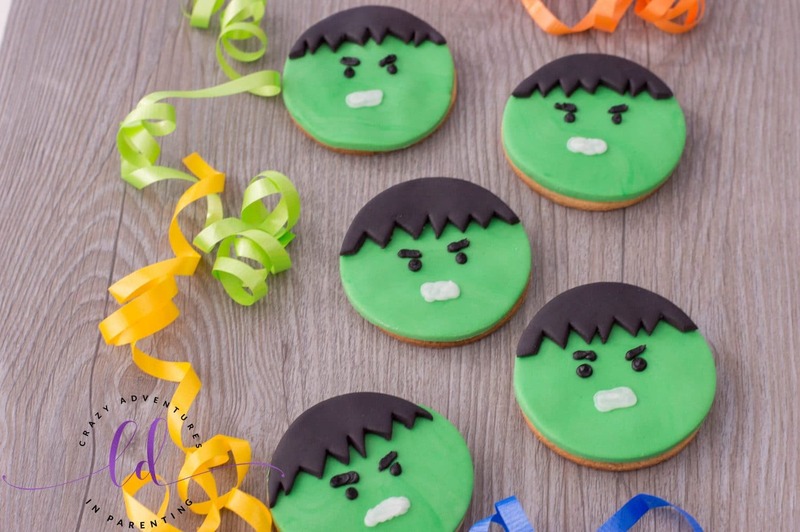 Your children’s faces will light up in all their superhero splendor when seeing these adorably simple and easy Avengers Hulk Cookies prepared just for them. Can you even deal with how adorable these are, not just for kids but for adults too? Who wouldn’t love to take a bite out of these Hulk Cookies? I tell ya, this has my brain spinning on all kinds of fun Avengers cookies and confectionaries I want to make in the future like this one! Use a cooling rack to help the cookies cool completely and thoroughly. You don’t want the ready-made fondant or the icing to warm up and slide off the cookie because they aren’t cool enough to work with. By using a good quality paring knife that’s either freshly sharpened or brand new, you will get the cleanest cuts for creating Hulk’s fondant “hair” on his head. By using a sharpened knife, there will be no rough edges as there would be with a dull knife. Save time and money by using a reusable silicone baking mat instead of parchment paper. This is my new favorite thing EVER! It makes baking on baking sheets easy and easy to clean up too! Now I never have to worry if I have any parchment paper left! Prepare your sugar cookie dough according to your recipe’s directions and roll it out on a floured surface so that it’s about ¼ of an inch thick. Using your 2-inch circle cookie cutter, cut out 12 cookies and place gently on a parchment-lined baking sheet (or you can use a reusable silicone baking mat). Bake according to your recipe’s directions and allow to cool completely before decorating. Complete coolness can be attained by using a cooling rack. On a clean surface, roll out your green fondant so that it’s about ¼ of an inch thick. Line a clean surface with a fondant mat. Using the same circle cookie cutter as before, cut out 12 green fondant circles and press one on each cookie. Roll out black fondant to 1/4 inch thickness and use the circle cookie cutter again to cut out six circles. Using your good quality paring knife to cut out the top and bottom of each black circle. These pieces will act as Hulk’s hair on each cookie. Use the sharp paring knife to cut out small, random triangles at the bottom of each black fondant piece. Press one on the top of each cookie. Using Wilton tip #4, frost out two black dots for Hulk’s eyes and two diagonal lines above them to make angry eyebrows on each cookie using the black decorating icing. Using Wilton tip #4 again, frost out a small white rectangular shape on each cookie using the white decorating icing. This will act as the Hulk’s mouth. Serve and enjoy! 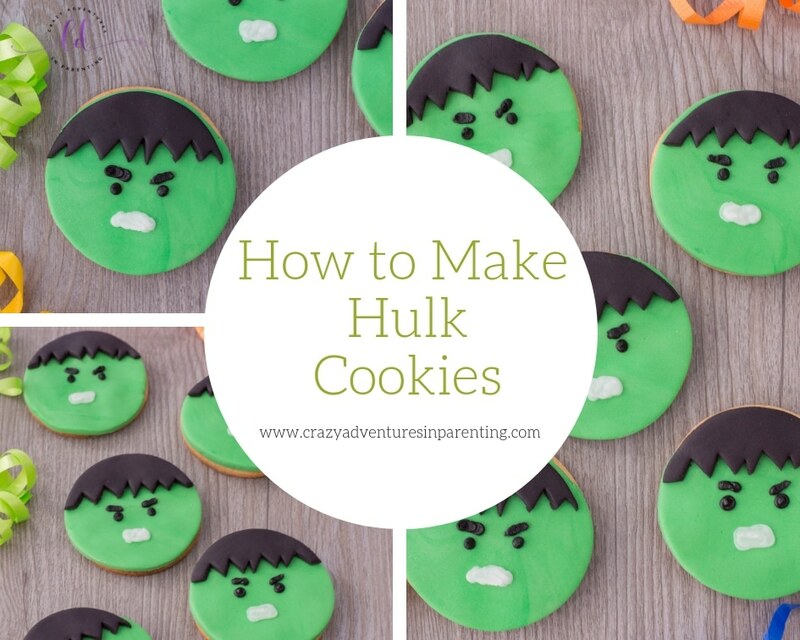 Are you in love with these adorable Hulk Cookies as we are! Full recipe is below! Check out all our other superhero recipes and crafts, like these Iron Man Cupcakes and Thor Cupcakes as well as Spiderman Slime Recipe! Be sure to also check out our other cookie recipes and dessert recipes, too! Prepare your sugar cookie dough according to your recipe’s directions and roll it out on a floured surface so that it’s about ¼ of an inch thick. Using your 2-inch circle cookie cutter, cut out 12 cookies and place gently on a parchment-lined baking sheet (or you can use a reusable silicone baking mat). Bake according to recipe’s directions and allow to cool fully before decorating. This can be attained by using a cooling rack. On a clean surface, roll out green fondant so that it’s about ¼ of an inch thick. Line a clean surface with a fondant mat. Using the same circle cookie cutter as before, cut out 12 green fondant circles and press one on each cookie. Roll out black fondant and use the circle cookie cutter again to cut out 6 circles. Using a paring knife cut out the top and bottom of each black circle. This will act as Hulk’s hair. Use the paring knife to cut out small, random triangles at the bottom of each black fondant piece. Press one on the top of each cookie. Using Wilton tip #4, frost out 2 black dots (for eyes) and 2 diagonal lines above them (for angry eyebrows) on each cookie using the black decorating icing. Using Wilton tip #4, frost out a small white rectangular shape on each cookie using the white decorating icing. This will act as the Hulk’s mouth.